Are we about to see chaos in the streets in major cities all over America? Antifa and other radical leftist groups are promising that a series of protests will begin on November 4th that will never end until “the Trump/Pence regime” is “removed from power”. And as you will see below, Antifa has openly and publicly embraced violence and the Department of Homeland Security says that they have engaged in domestic terrorism. Hopefully these “protests” will fizzle out after a few weeks, because political organizations that believe in “the necessary use of violence” have no place in our society. That sounds pretty serious to me. Hopefully they are not able to back up their words with actions. Anti-fascist activists, or “antifa,” increasingly mobilized in the wake of President Trump’s election, are unapologetic about what they describe as the necessary use of violence to combat authoritarianism. 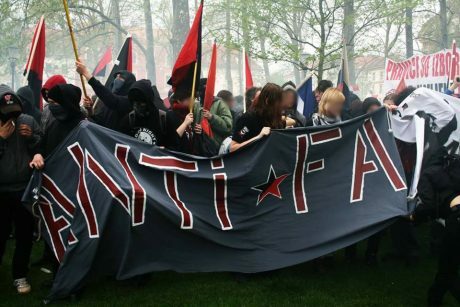 While both experts on the movement and activists within it emphasize that not everyone who participates in anti-fascist activism engages in violence, they say the use of force is intrinsic to their political philosophy. Needless to say, the Hill is not exactly a conservative publication. Hundreds of masked protesters at the University of Minnesota recently conducted a violent protest against a speech by conservative activist and YouTube commentator Lauren Southern. Fights erupted outside the event, forcing police to intervene. Members of the conservative group Collegians for a Constructive Tomorrow (CFACT), which hosted the event, say they were “tagged” and set upon by masked antifa activists who spat on them, hit them, shoved them off bicycles and maced them. These crazed lunatics actually believe that Donald Trump is a modern day version of Adolf Hitler, and therefore they believe that the use of violence is justified in order to prevent a new “Nazi regime” from taking over America. Are you starting to understand how dangerous these guys are? A secret FBI investigation of the violent ‘resistance’ movement on college campuses against President Trump has led to an alarming discovery—the collusion between American anarchists and foreign terrorists in the Islamic State and Al qaeda, according to a confidential ‘Informational Report’ by FBI field offices. ‘There is clearly overwhelming evidence that there are growing ties between U.S. radicals and the Islamic State, as well as several [ISIS] offshoots and splinter groups,’ stated the FBI field report, which was delivered to Acting Director Andrew McCabe on July 11, 2017, and which is being published for the first time in my new book All Out War: The Plot to Destroy Trump. An atmosphere of violence and fear creates an environment in which many conservatives are afraid to speak out. The Cato 2017 Free Speech and Tolerance Survey, a new national poll of 2,300 U.S. adults, finds that 71% Americans believe that political correctness has silenced important discussions our society needs to have. The consequences are personal—58% of Americans believe the political climate prevents them from sharing their own political beliefs. Democrats are unique, however, in that a slim majority (53%) do not feel the need to self-censor. Conversely, strong majorities of Republicans (73%) and independents (58%) say they keep some political beliefs to themselves. But this is not what our founders intended. Freedom of speech is in the Bill of Rights for a reason, because without it we would be in a world of trouble. No matter how crazy they get, we can never allow Antifa to intimidate us. We are in a battle for the future of America, and the fate of our children and our grandchildren is hanging in the balance. The radical left must not win, because if they do they will transform our society into a totalitarian socialist “utopia” that will look nothing like the nation that our forefathers originally founded.